'Exercise' - it sounds like work, doesn't it? Hard work. When I first tried to get in shape I was about 14, and I would dance in my bedroom for half an hour, every Sunday. I quickly got bored with it because it was one of those 'have to do's rather than 'want to do's. I don't really know what changed this time, but I can tell you what kept me going: I was doing something fun. And, above all else, that's what you need to look for when you're first starting out. You need to find something that you'll look forward to doing, and for me that was dancing. Let me be clear, though: I cannot dance. I struggled big time initially to grasp the movements, but I kept up with it because I was determined to be able to perform the moves of the simple little 10 Minute Solutions dance DVD I'd bought. I wanted to know how to dance and the only way for me to do that was to not give up on the DVD. Since then I've bought about 8 other dance workout DVDs and I'm picking up the movements very, very quickly now. I was also very, very self-conscious about it - I still am - I didn't want people to watch me, so I told everyone in the house quite seriously that I didn't want anyone watching, and I drew all the curtains, too. I was still self-conscious, but the desire to dance and lose weight came above that and I was able to keep going. Only once you've found something you enjoy will you have any hope of keeping up with it, so do that. Enjoy swimming? Running? Dancing? Football? Do it, then! Let yourself enjoy it and think of it more as a fun activity than exercise. Then you'll look forward to it and it will very quickly stop feeling like work. You also need to make sure you realise that you're only doing this for yourself, and losing weight is not the only thing you'll take from exercise. I promise you, you will feel happier and you will feel stronger long before you get your ideal body, and that's not just something people say. Exercise helps health and fitness quite directly, and that in turn helps your hormones and how you deal with them. You will find greater self confidence, and you will feel happier - noticably so, I assure you. I'm not one to go on about things if I don't truly believe it, even in product review posts that might SEEM like I'm saying all the right things, I truly mean everything I say (and often decline products I'm not interested in or don't believe in). And telling you all of this is exactly the same. It's the honest truth. You also need to realise that you don't need to go to a gym to lose weight, you can do all of it in your living room with the right kit (and that doesn't mean clunky rowing machines and treadmills, it means dumbells, resistance bands and body weight) - but the kit comes later. If you're just starting out, don't think about weights too much, just think about enjoyment. Once you find something you enjoy, you'll also realise you enjoy the 'high' of working out an be keen for more. You may well also develop a much clearer idea of the body you want and think more about how to achieve it. 1. Find something you enjoy before thinking about dumbells and push-ups. For me, that was dancing. I bought myself some dance DVDs, closed the curtains, warned everyone upon pain of death to leave me alone and started dancing. I was terrible initially, but I grasped the moves in time (keep moving even if you can't quite get the moves, because even if you're not matching the choreography perfectly, you will still be getting a good workout), and now it takes me a lot less time to grasp the moves of new DVDs. 2. Do it for you and only you. Don't let anyone else influence you except in a positive way, and if anyone ever has the audacity to make fun of you for working out, remind yourself that they genuinely have no justifiable, logical reason to be doing so, because what you're doing is positive and good and fixing what they would otherwise perhaps be making fun of you for. 3. You can achieve your dream body in your own home. There's no need for gym memberships - however, a gym membership can give you access to unique classes, new friends and help tailored to you, and a lot of people in gyms are quite nice and helpful, whether they work there or merely work out there. Don't let yourself get intimidated by anything, either. DVDs are just DVDs - don't let them conquer you. Neither you 'nor the DVD gain anything by doing so. 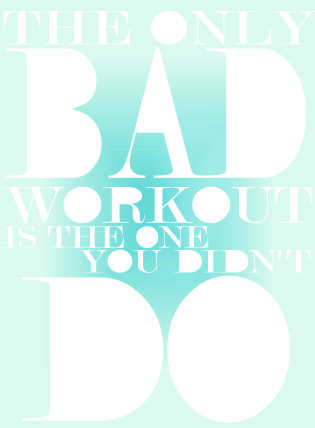 'The Only Bad Workout Is The One You Didn't Do' print by ModernLuminous on Etsy. At the end of the day there's nothing stopping anyone from starting or continuing but themselves. And giving up doesn't benefit anyone, either.